Last Minute Rush for School Supplies?! If you are like me…I always wanted (and still want) to enjoy every last ounce of summer before its time for the 'back to school' rush. We almost always missed the ‘tax-free weekend’ because we were away or just plain forgot about it. So, that meant the scramble a week before school began to get all the supplies needed for the first day. Here are some tips you can do right now, even if school starts next week, and plan to get to the store this weekend to get those last few items you may still need. Start by having the each child go through what they brought home last year and did not use. We used to clear off the dining table and collect all the potential school supplies from around the house. Check backpacks, drawers, cupboards, under the beds, in the closets…. This way we could see what we had, make a list and when we went shopping we knew exactly what we were lacking and could focus on purchasing just those items, not assuming or wondering if we already had it at home. Most of you know that I am big on recycling and although my 15-year-old daughter is "Ok" with it now, when she was little she always wanted all her supplies to be brand new. Ugh, if that’s your world…good luck. They will grow out of it. Here's a suggested quick tip though: try to get your child to use the ¼-used erasers and glue sticks, pencils, pens, markers etc.…I would put them all in her ‘new’ pencil box, and that helped. Well, here’s to a safe, fun and educational 2018-2019 school year. May we all survive to do it all over again next year. 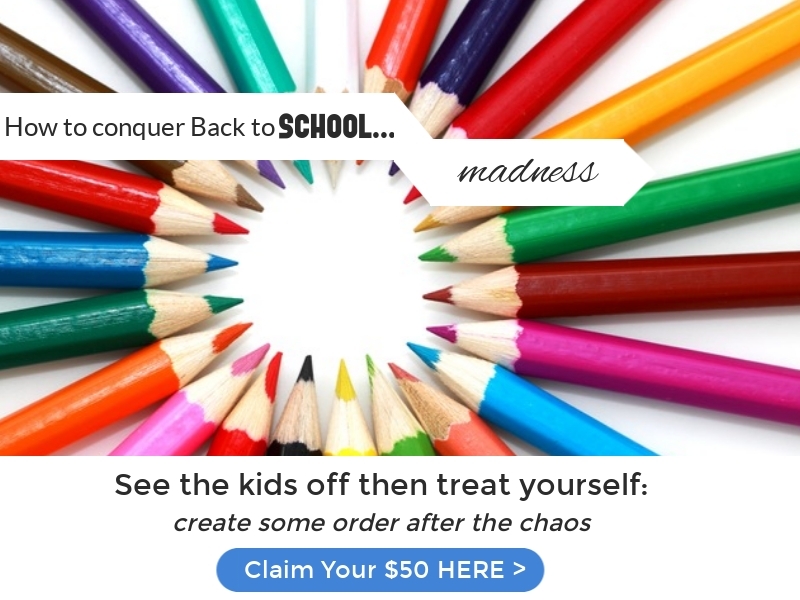 Use code #BTS50 to refer yourself or a friend on our referral page and claim your $50 off organizational services.